My own grandmother would have cooked on a barbecue over the last few weeks the weather has been so glorious. There is something about cooking outside and eating outside that whets the appetite and makes us look at food differently and prepare it with more thought and appreciation I think. Unless you are a diehard barbecue cook who fires up the coals in all weather, the barbecue is something that most of us only pull out from under the mouldy tarpaulin a few times a year. Therefore, below is a list of what I have found to be barbecue essentials. Tools of the trade – If you find tongs useful get a long handled one. You’ll save your hands and forearms from getting burnt as you turn meat that will spit and burn. Better still get a proper long handled meat fork. It’s really the best thing to use. Also, wear an apron. There’s no point cooking an amazing meal and then looking like the St. Valentine’s Day massacre when you’re finished. The most useful tool I have found for a barbecue is a wire brush to clean the grill with. Obviously, it’s important to clean the grill after the barbecue – a clean grill will ensure meat and vegetables don’t stick during cooking. But also give the grill a brush between batches during cooking. This stops meat drippings and charred bits from sticking and burning onto the next batch. Trial and error however has taught me to always buy a good quality wire brush in order to avoid picking metal prongs out of your burger! Cooking tips for the barbecue – Meat should be seasoned with salt before grilling. Use good big tasty flakes of sea salt for this – Achill Island Sea Salt is ideal. As salt will draw moisture out of meat, it is important to season just before grilling. The salt enhances the flavour of the meat and also builds up that char crust that is so delicious on well barbecued meat. As the meat comes off the grill, you can season with some ground black pepper. It’s hard to tell sometimes if meat or poultry is cooked when cooking on the barbecue. It is important not to under cook meat especially poultry but it is also so important not to overcook. I always use a meat thermometer for this. Then I’m confident the meat is cooked to perfection. Sometimes if I am cooking a lot on the grill, I tend to barbecue the chicken first. I like to cook chicken on the bone. I barbecue it first to get that char and flavour and then I finish the pieces off in a pre-heated oven. They have the barbecue flavour and are also cooked through by the even oven temperature. They are then finished at the same time as other cuts of meat that can be served rare or medium. Below is a table of internal cooking temperatures – make sure to insert your meat thermometer into the thickest part of the piece to check the temperature. Then sit out and enjoy your barbecue feast in the best country in the world when the sun is shining! NOTE: Ok so I forgot to post this here before Christmas and before you would actually need it! It was published in The Western People on the 21st December in good time for Christmas! The Christmas day dinner is all about timing but more importantly having time yourself to enjoy it, not sweating and slaving over a dinner that’s going to be devoured, let’s face it, probably in 30 minutes flat. I usually do the cooking in our house as there’s less call for the fire brigade that way. I used to be a purist about the turkey. I always wanted the whole roasted bird in all its glory for carving on the day. I maintained that the whole bird roast was needed to make good gravy. I was converted two years ago by a butcher that I know well (the hubby) to try boning, rolling and stuffing both the breasts and the legs separately. This meant that the breasts went into the oven much earlier than the legs and both emerged perfectly cooked and still wonderfully moist. And you could use two different types of stuffing to satisfy everyone’s taste. I had a roomier oven to cook all my veggies as we love simply roasted root vegetables such as carrots, beetroot and parsnips not to mention the goose fat roasted potatoes. But I still had the problem of the gravy as very little pan juices would come from the boneless bird. I decided to roast the carcass of the turkey on Christmas Eve on a regular roasting tray and make the gravy using these pan juices and a stock made out of the giblets. So the gravy along with the ham and the stuffing, was made the day before. As a result I only had one pot on the hob on Christmas day for mashed potatoes and a very tidy kitchen! It’s on the cards again for this year but for you purists out there, I have below some cooking times for the whole turkey and the ham and a fool-proof turkey gravy recipe. Have a happy and healthy Christmas and New Year everyone. You will need c. 300g butter, at room temperature. Weigh your stuffed bird and calculate the cooking time: 15 minutes per pound up to 14lb and for each extra pound allow 10 minutes. Therefore, a 14lb turkey will take 3 ½ hours and a 20lb turkey will take 4 ½ hours. Place the bird in a large roasting tin, breast-side up. Use your hands to loosen the skin from the breast and the legs taking care not to tear the skin. Rub half the butter under the skin and the other half over the skin. Season well with salt and pepper. Cover the turkey with foil and roast for 40 minutes. Then lower the temperature to 170⁰C and cook until 30 minutes from the end of the cooking time, basting occasionally. Remove the foil and cook for the remainder of the time to brown. Juices will run clear when cooked – Internal temperature of 74⁰C. Up to 4 ½lb in weight, allow 30 minutes to the pound and 30 minutes over; 4 ½ – 10lb, allow 20 minutes to the pound and 20 minutes over. Extra-large ham times roughly are: 12lb = 3 ½ hrs; 16lb = 4hrs; 20lb = 4 ½ hrs; 24lb = 5 hrs. Put the ham in a very large pan, cover in cold water and bring to the boil for 10 minutes. Discard this water and fill pan again either with just water or a mixture of water and cider. Add a chopped onion, carrot and celery along with a bouquet of parsley, bay leaves and thyme tied together. Cook for the calculated time. IF GLAZING, remove the ham 30 minutes before the end of the cooking time. Remove the skin and cut a diamond pattern into the fat. Preheat oven to 190⁰C/375⁰F/Gas 5. Mix together 1 tablespoon wholegrain mustard, 1 tablespoon muscavado sugar, 1 tablespoon honey. Smear all over the ham. Stud the diamonds with whole cloves in the traditional way. Or I also like to slice an orange thinly and stud the slices with the cloves onto the ham prior to glazing. You will need: 1.9l pan dripping from the roast turkey; 200g butter; black pepper; 170g plain flour. Extra thinners can include red wine, marsala. Drain pan juices from the roast turkey through a strainer and allow to sit. Skim the settled fat off the top. Make up the juices to 1.9 litres using either chicken stock or stock made with the giblets (boil the giblet in some water with onion, peppercorns, carrot). Melt the butter in a medium saucepan over a very low heat and add freshly ground black pepper. Add the flour and whisk continuously for 3-4 minutes over a low heat. Slowly add the turkey juices and stock, whisking constantly over a medium heat until bubbly and thickened. To thin the gravy slightly and add flavour and complexity, use some red wine or Marsala wine. Taste and season if required. Serve in a hot gravy boat. Published in the Western People 21st December 2015. Sunday is our family day – it’s the one whole day we’re all together in the week. Cooking on Sundays is one of my favourite things as I have time. I have to say that I tend to be a lazy cook during the week as, like most people, whether working or homemaking, find time is at a premium. Therefore, the Sunday roast serves another purpose – I cook for leftovers. If saves time and roasts also make dripping. I realise it’s a controversial subject but dripping holds an amazing amount of flavour. Our grandparents used it all the time but a lot of people are concerned about saturated fat levels and rightly so with issues like obesity and heart disease. If you cook fresh food as opposed to eating processed foods, fast foods or takeaways, using a little dripping with whole fresh ingredients will result in much less saturated fat than in the processed alternative. Using one small teaspoon of dripping to start your stew or soup is the best stock cube you could wish for. One of my favourite big roasts is a slow roasted shoulder of pork. I usually use half a shoulder as it will weigh about 4.5kg. I save this for Sundays when family or friends might be visiting as it will feed 8 including extra for all-important left overs. Also shoulder of pork is very economical. Buy the best pork you can. I have a few tips. Firstly find a butcher that handles whole carcases as these will be able to give you a shoulder in the first place, and it will probably be fairly local. Secondly, they will be able to give you a shoulder with skin on and bone in, a must for crackling and flavour. If your butcher handles whole free-range pork, it is probably local and you may be surprised at how little extra you have to pay to go free-range. Remember that the more off-beat cuts such as shoulder, belly or hocks that require that extra bit of time and care are the less sought after cuts and are therefore cheaper. Get the best you can for your money – it’s out there, especially if you’re a willing and eager cook. You won’t be disappointed – think of the leftovers! 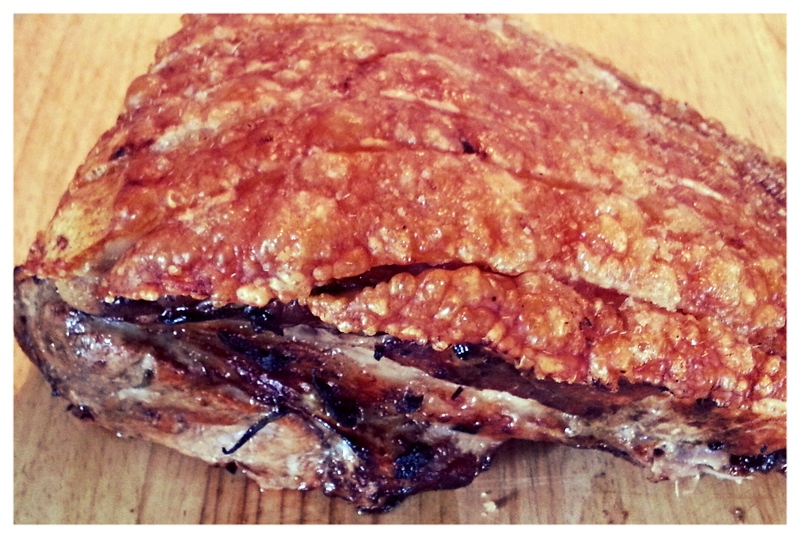 Slow roasted shoulder of pork – they don’t call it slow for nothing as you will need 5-6 hours. Take the pork out of the fridge to come to room temperature. Preheat oven to 220⁰C/425⁰F/gas 7. Crush the fennel seeds in a pestle and mortar with a good pinch of sea salt and pepper. Rub all over the pork with a good glug of oil making sure to get well into the scores. Meanwhile peel and quarter the onions. When the time is up, pour away all the fat (or transfer when cool to a jam jar to keep as dripping in the fridge). Put the onions and bay leaves under the pork in the tray. Pour in 750ml water and cook for 2 hours. Baste with tray juices and add the halved apples to the tray with a little water if required. Roast for a further 2 hours until the meat pulls away from the bone freely. Remove from oven and transfer to a plate with the apples and cover. Put the roasting tray, with onions on a medium heat on the hob and stir in the flour. You should have plenty of liquid to make gravy. Add the pork resting juices. Stir well and simmer until a good consistency is reached. Pour through a sieve into a jug. Serve everything together with seasonal greens along with your own usual trimmings. Don’t forget to make good use of the leftovers during the week! Well ‘back to school’ time is almost upon us again. Every year I feel torn at this time between the craziness of summer with the kids and the comfort of the routine of school. I have to be honest and say that there was a time when I didn’t think much of the notion of having a dinner plan for the school week. I used to think that it would take too much time to do and took the spontaneity out of food. Then, of course, as the kids came along and got a bit older, I learn that ‘spontaneity’ was a luxury that ironically, someone with time would have! This last school year, I found it not only invaluable but absolutely essential to plan the week of dinners in advance. If I didn’t I found that I either had nothing really to cook when I got home or I would spend too much money buying ingredients for one-off meals that hadn’t been properly thought through. This ultimately meant a lot of waste in the kitchen aswell. I suppose this is all just about good housekeeping but for me, I didn’t really learn what that meant until the kids came along. You don’t want hungry tired children finishing school with no dinner in sight. Life is too short for that! The weekly dinner menu does get predicable but they are all dinners that are made from scratch, made relatively quickly, have plenty of vegetables and flavour at their core and the kids love them. Our meals include the predictable spaghetti bolognaise, chilli, chicken curry, pork meatballs and pasta, homemade fish fingers with potato wedges and veggie frittata (which is basically a massive omelette containing vegetables mainly potatoes). Monday’s dinner is always based on leftovers from the Sunday roast. If we’ve had roast chicken, the leftover chicken (you’d be surprised how much meat you can get off the carcase) is bulked up with plenty of vegetables to make a chicken curry. This could even be done on the Sunday evening but that’s always been wistful thinking on my part. The kids’ favourite is meatballs in tomato sauce. We use our own Fennel and chilli meatballs from the shop but you could use a good sausage that has the flavours that you want to taste in the finished sauce. Our hot Italian sausage does the job well as does Jane Russell’s Fennel and chilli sausage. Find a highly flavoured sausage with high meat content that your family likes. You could fry off the sausages directly and roughly chop them or use the sausage meat as follows. For a meal for 4 there is plenty in 500g of sausage meat. Squeeze the meat from the casings into a bowl – kids love doing this! Smell the meat. If it seems to be lacking on the aroma front you can add some finely chopped red chilli or garlic to your taste, a teaspoon of cayenne pepper and maybe a tablespoon of ground fennel. Mix well with your hands and form into meatballs. Colour the meatballs gently in the bottom of your casserole pot. They don’t need to be fully cooked through but just firmed. Add a finely chopped medium onion at this point. When the onion is softened a little, add a full 700g jar of passata. Find a brand that doesn’t have sugar listed in its ingredients. It should only contain sieved tomatoes and a little salt. Let the pot bubble away for about 30 minutes on a very gently heat. If you have good sausage meat with plenty of flavour either in it or added, these flavours will leech out into the tomato sauce. Finally, to add some extra fibre, strain a 400g tin of Barlotti beans and add towards the end to heat through. Once cooked, taste and check for seasoning. 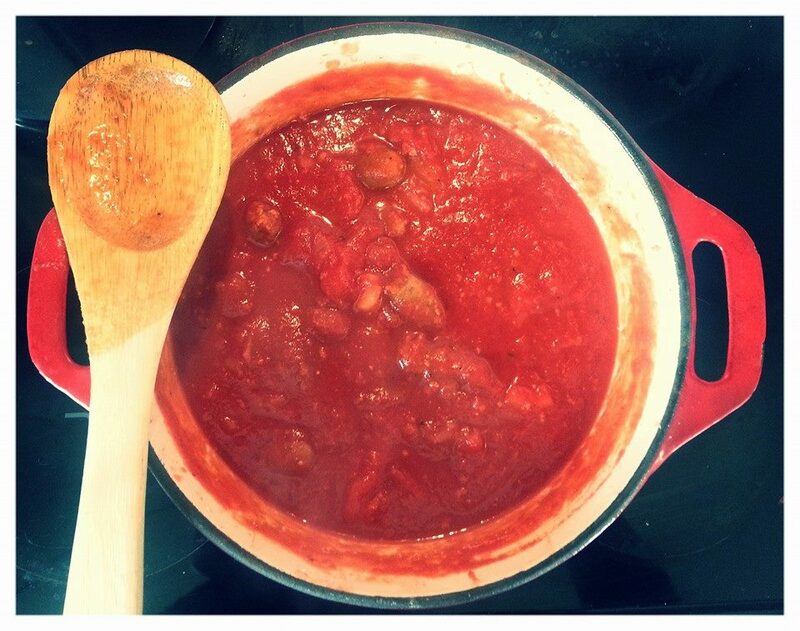 If the passata you’ve used is a bit acidic, you might want to add a teaspoon or two of sugar to balance the flavour. This is actually a very quick dinner to make and there is always a queue for seconds! First published in The Western People on 24th August 2015. Not being from a farming background and having been in contact with butcher shops that refer to lamb as lamb when it is actually hogget, I used to always wonder when a lamb became a hogget and indeed, when the Spring lamb season actually ended what with Easter being a movable feast. 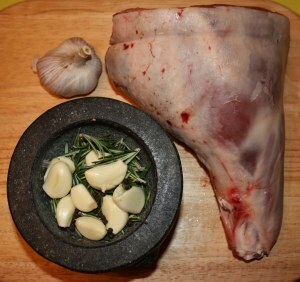 I have since learned that spring lamb is in season for a few weeks around Easter when the lamb is around 5 months old. It is known as lamb from then on until Christmas time after which it is called hogget. At two years old it is referred to as mutton. As most sheep are grass-fed, Ireland produces the most excellent flavoured lamb. Mountain breeds tend to be leaner than some of the other lowland varieties, but living on different grasses, heather and wild plants gives mountain lamb a very distinctive flavour. Lamb from the hills of Connemara, Kerry, Donegal and Mayo’s own Achill Island has become sought after for this flavoursome distinction. Hogget has a more pronounced flavour to lamb and I much prefer it. Mutton is stronger again in flavour and can be a bit tougher if not treated with care in the kitchen. Most people I have spoken to about mutton speak of a lasting impression left on their sense memory of the smell of it boiling in their mother’s kitchen as children. Undeterred by this, I have tried but have found it difficult to get mutton as I believe farmers can’t afford to keep the lambs this long for a relatively small number of interested people! But I will persevere. The following recipe is incredibly easy and is good in the depths of winter as well as on the BBQ – which is just as well with the weather we’ve been having! Ensure the meat has been left out of the fridge to come completely to room temperature before roasting. I usually leave it out for at least 1 hour. Strip the rosemary leaves off the twigs and set aside. Place the twigs in the bottom of the roasting tray, and place the opened out lamb on top. Your butcher can bone the leg for you. I usually keep the bone and add it to the tray for roasting if there is room. Put all the remaining ingredients, including the rosemary leaves, into a processor and blitz. Spread this paste over the lamb. Roast in the oven for 40 minutes, or until the lamb is still nicely pink inside. Set it aside to rest for at least 15 minutes before serving. Deglaze the roasting tin with 200ml of wine, stock or water to make simple delicious gravy. “Every French home cook does a great chocolate cake” or so says Trish Deseine in her book ‘Nobody does it better’. The ‘Somebodies’ that the ‘nobodies’ do it better than are the French. I love France and the affair started with their wine and food long before I ever set foot in the place. As a result, when I started learning about cooking and searching for information, one of the first books I bought was Larousse Gastronomique, the culinary encyclopaedia. When it was first published in 1938 it was written by French chef Prosper Montagné. It’s incarnations since have been written by scores of writers who form the Gastronomic Committee of the Librairie Larousse. It is an excellent reference for cooking techniques, history of food and important culinary individuals, ingredient information and not to mention recipes for pretty much anything you might like to cook. In the beginning it was the book I went to for things like how to make a roux for a béchamel sauce, or indeed to find out what a roux was. These were things that I needed clear instruction on as I had never done home economics or had studied anything to do with cooking. I was starting completely from scratch in my own tiny kitchen in a flat in Dublin. As Larousse Gastronomique was essentially based on classic continental cuisine, when looking for a good instruction I did move away from it slightly when I found the book Ballymaloe Cookery Course. This was much more accessible both because it was Irish and because Darina Allen’s instruction was so precise. I still did love the French. And what could be better than a French cookbook written by an Irish woman living in France! I found myself then faced with Trish Deseine’s statement that every French home cook does a great chocolate cake. Far be it from me to let the side down so a few years ago I went through the arduous task of find our chocolate cake recipe. We went through everything from basic chocolate sponges with various fillings such as chocolate ganache or chocolate Chantilly cream to the princely Black Forest gateaux. Sean, being a complete chocolate addict, relished this quest. We went full circle and the cake that turned out to be our favourite was one of Trish Deseine’s French recipes! 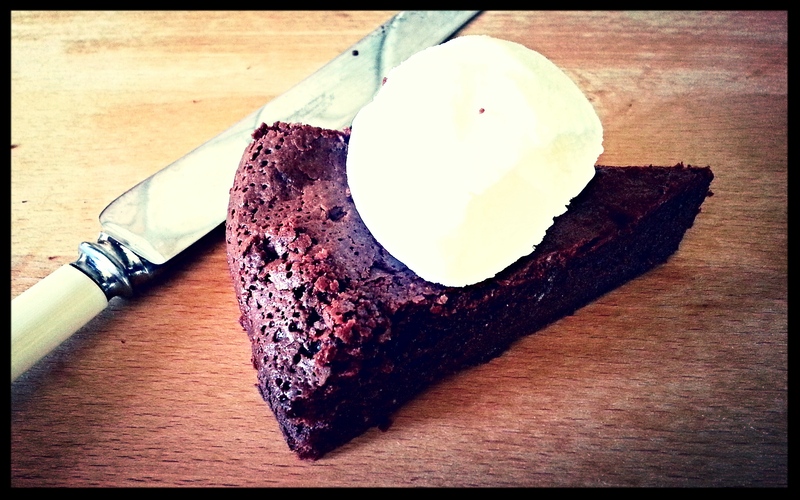 It’s a chocolate fondant cake and so simple to make. The only drawback is that it should be made a day before it is needed so allow the chocolate flavour to fully develop. Also, for those of you who are wheat intolerant, it only has one tablespoon of flour in it. It’s not perfectly gluten free for coeliac sufferers but might be acceptable for the wheat intolerant chocolate addict in your house. It isn’t the prettiest chocolate cake in the world, but that taste…. Preheat the oven to 180⁰C/350⁰F/gas mark 4. Grease and flour a 25cm sandwich tin. Place a mixing bowl over a saucepan of barely simmering water. Break the chocolate into it. Pour in the hot coffee and stir until the chocolate has melted. Add the butter and let it melt into the chocolate. Add the sugar into the mixture and stir very well. Break the eggs into the mixture one at a time, stirring well after each addition. I use a balloon whisk for this. Finally, mix in the flour. Pour the mixture into the sandwich tin and bake for 20 – 25 minutes. The cake should still be very moist in the centre. DO NOT be tempted to leave it in longer. Remove from the oven and leave it to cool completely before turning it out. Wrap the cake in foil and try to resist it for at least a day. (Easier said than done). Best devoured simply with good vanilla ice-cream. I’m an asthmatic. I’ve had a runny nose most of the time for most of my life. I was given a natural remedy book by a good friend in college and discovered the benefits of Urtica dioica, more commonly known as nettles, in there. The plant, which was the bane of my young life running around the fields of Connemara, could, according to this new book, be the cure for my ever running nose. In particular in the spring time when I was most affected. Stinging nettles love Ireland’s moist fertile soil and so grow all over the place. They should be picked in spring when they are young and tender. Trial and error has taught most of us that hand protection is required when picking them, but if you do get stung dock leaves shouldn’t be too far away to rub onto the affected area hence the old saying stated above. The alkaline secretions of the dock neutralises the acidic sting of the nettle. Nettles are used as remedies due to their high iron and vitamin C content, not to mention histamine which is what helped to curb my rhinitis during the spring months. My grandmother used to say that nettles when taken in a tea in the month of May would purify the blood for the year. She wasn’t too far out because the minerals (formic acid, iron, potassium etc.) in nettles have been proven to reduce blood pressure, lower blood sugar and improve circulation thus purifying the system. And they are at their youngest and most tender in the month of May. Clever people our ancestors. Before consuming nettles regularly, make sure to firstly check with your doctor if you are on medication, as nettles can interfere with certain pharmaceuticals. Also, make sure to always pick your nettles, or any wild plant for that matter, from an area that is not near any area that has been or potentially could have been treated with any sort of chemical. There is little point in the health benefits if you’re also consuming a nice dose of herbicide! Nettles can be consumed in many recipes but I’ve only used them regularly in three. The first being the simplest: tea. 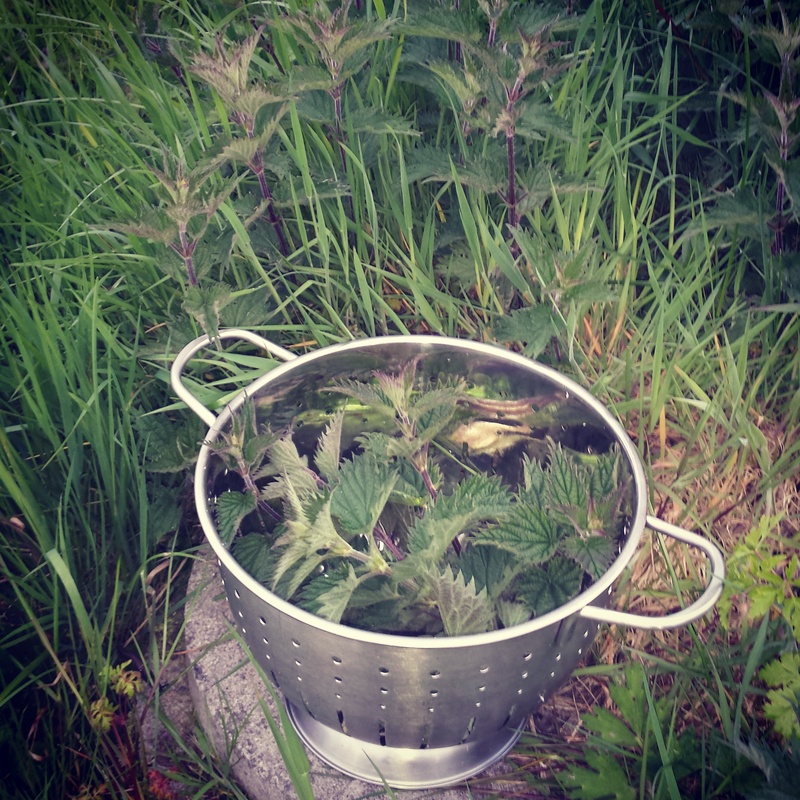 Brew a bunch of tender stinging nettle tips in almost boiling water and drink daily (for the month of May, if following my grandmother’s tip!) Another recipe I sneak them into is champ. I simmer a bunch of chopped nettle leaves in milk for about 10 minutes before adding them to the mashed potato. Our favourite spring recipe for nettles though is nettle soup. I basically substitute nettles for leeks in a traditional leek and potato soup recipe. Note: When picked, nettles should be used as soon as possible as they wilt quickly. Gently melt a knob of butter and a little oil in a heavy bottomed saucepan over a low heat. When melted, add the chopped onions and potatoes. Cover and sweat very gently over a low heat for about 10 minutes until the vegetables are softening but not browned. Add the chicken stock and boil until the vegetables are cooked. Add the nettle leaves and simmer for a few minutes. Add the milk and liquidise. Season to taste with salt and freshly ground pepper.